Betters may not trust the Bears yet, but Khalil Mack and Co. have been among the best in the league against the spread this season. In the intro this week, we decided it's about time to update all of you loyal readers (Hi Mom!) (Just kidding there's no way our mothers read these) about how each team is doing against the spread so far this season. 1. Teams with good records against the spread will continue to have good records against the spread. Obviously, this one isn't true. As teams keep covering spreads, those spreads get higher and higher. The Chiefs would not have been favored by 16.5 points against the Cardinals in Week 1. But, as the Chiefs keep winning (and covering) and the Cardinals do the opposite of that, the spreads get bigger. And as the spreads get bigger, they get harder to cover (obviously), and the good teams will cover fewer of them. 2. Teams with good records against the spread are likely to lose more going forward. This is a slight offshoot of the Gambler's Fallacy. Just because the pendulum has swung one way doesn't mean that the pendulum will swing back the other way. If a coin comes up heads five times in a row, it's not suddenly more likely to come up tails on the next flip. Granted, it's not exactly the same with point spreads, because they're obviously not all 50/50 propositions by nature, but the books (for the most part) intend them to be. A team that's 8-2 against the spread isn't suddenly likely to finish 0-6 against the spread to finish the season at 8-8. It means that for the last six games of the season, they're likely to finish in the neighborhood of 3-3. So, as we look at these against the spread records, here are a few things to keep in mind. A. For the immediate future (i.e. this week and next week), you might be able to find some value betting against teams at the top of the standings or for teams at the bottom of the standings. Does that contradict what I said literally one paragraph ago? Kind of. They aren't more likely to lose more going forward because they have a winning record. But it IS more likely that Vegas hasn't quite zeroed in on how good/bad those teams are yet, and you might find value in the short term. B. Is there a really good team with a not-so-great record against the spread? It's probably because the play games that are closer than Vegas thinks they're going to, and you might find some value betting against them. The opposite is also true - maybe bet on a bad team with a record against the spread better than you'd expect. C. Are there teams that you've been bad picking for or against? Check out their record. If they're right in the middle, don't worry about it - you're probably just getting unlucky. If they're especially good or especially bad, then worry. That means that they've been consistently better (or worse) than your evaluation of them, and you might want to re-think your approach. D. One last note - we're pulling these records from VegasInsider.com, which judges them based on the "Vegas Consensus Line" (the average of all the prominent Vegas sportsbooks) when the lines close (usually just a few minutes before kickoff), which sometimes are different than the lines we use in this space (which we usually pull Thursday night or Friday morning), so these records against the spread are likely just slightly different than they would be based on the lines we pick. Jeremy made up some ground last week, with a solid 8-5-1 mark, notching a 5-3 record on the disagreements (and still contends that Kansas City should have covered if they had put forth any effort at all in the fourth quarter, but that's a story for another time), which means Joe's lead is just four games heading into the week. Here are the Week 11 picks. We figured we'd start the week with a nice push, just ease our way into it. JC: We're at the point in the season where, for a few of these games, a "which team needs it more?" approach might actually be acceptable. Detroit's season is pretty much over, but Carolina needs a win if they want any shot of keeping pace with New Orleans. They're likely to make the playoffs anyway (the mid-tier teams in the NFC are shockingly mediocre this year, 9-7 should make the playoffs), but I think they've got more motivation here than Detroit does. Then again, I've been missing on Detroit games all year. JP: This game has "bounce back" written all over it for Carolina. I just can't see the Panthers coming out flat after last Thursday's embarrassment in Pittsburgh. JC: It's tough to find a reliable line on this game because of Joe Flacco's injury throwing the line into a bit of havoc, but I did see this one from a real source, and I figured it's juicy enough to jump on. If Flacco ends up being available, this price is an absolute steal. It might turn out that way anyway, because Joe Flacco hasn't exactly been great this year - the strength of this Baltimore team certainly isn't its quarterback play, and I wouldn't be surprised if a backup (likely Lamar Jackson) is able to light up a terrible Cincinnati defense anyway. JP: We knew Cincinnati's defense was bad, but the dam has freakin' broken of late. I'm not concerned about Flacco. In fact, I want to see Lamar get his first extensive action against this defense so they can really turn him loose. Either way, this feels like a loser leaves town game in the AFC North. JC: This seems like as good a time as any to really put my "Chicago isn't actually that good" theory to the test. If Chicago is legit, covering a spread less than a field goal against a team of comparable ability shouldn't be too difficult. But if they aren't, this seems like the kind of game that a young team with a young and only semi-reliable quarterback squanders to a veteran team with some impressive road performances already this year. 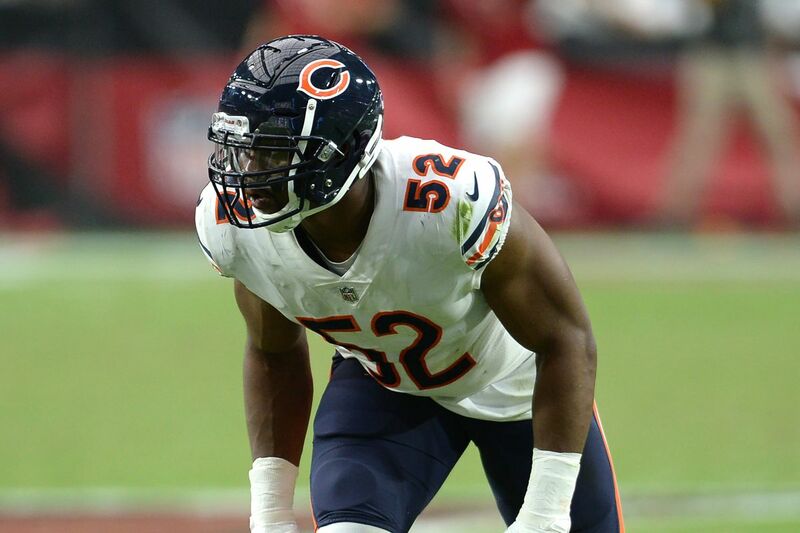 JP: Chicago is good (ton of talent on defense, at the skill positions, and promising signs from a young QB), but I'm not sure if the Bears are trust worthy yet. The Vikings, by virtue of their electric passing game, are, so I'll take the Vikings to keep this thing within a field goal. JC: This Eagles team is bad. They're banged up on defense, they have no running game to speak of, and their passing game can only be considered efficient, but certainly not explosive. Without the defense and ground game, they can't do the ball control/grind clock gameplan, and with a mediocre passing attack, they can't win a shootout, so I'm not sure how they keep this game close, especially on the road. JP: New Orleans should continue to cruise, so I'm sure this will be way closer and more stressful than it should be. Still, I can't bet against my man Drew in the Dome. JC: Okay, so maybe the Titans are good. I was tempted to take the Colts here, with their recent run of success, but I was dissuaded pretty quickly when I looked at their schedule and realized those wins were over Buffalo, Oakland, and Jacksonville at home. Not exactly awe-inspiring. Tennessee has put up a few inexplicable stinkers this year, but they've put together a pretty impressive resume otherwise (wins over New England and Houston, wins at Dallas and Jacksonville, and almost a win at the Chargers). At the very least, they can use the same recipe that got them into the playoffs last year, with a good defense, a good running game, and winning the turnover battle. JP: Still not sure what to make of the Titans, even at this point in the year, and the Colts could be way better or way worse than I think... Yeah, throw a dart, I have no idea. Gimme the team that just beat the Patriots by a 100 over the one that squeaked by Jacksonville, I guess. JC: I've yet to see anything from the Chargers this year that makes me think they're anything less than a 12-4 (or better) caliber team. If Denver is going to keep this game close, it will need to be thanks to their ground game (No. 2 in yards per rush, No. 5 DVOA) helping them control the clock, but Denver has also turned the ball over in every game this year, which doesn't really make me optimistic about their potential to cover an otherwise reasonable spread. JP: The Chiefs, Patriots and Steelers are getting all the headlines in the AFC, but you're right, the Chargers are legit. LA continues its march to the playoffs with another big win. JC: If you notice above, the Cardinals have actually been decent against the spread this year. Meanwhile, Oakland has lost six games by 14 or more points this year, and by seemingly any metric is the worst team in the league this year. The Cardinals' defensive unit is actually, like, kind of medium, so I guess I'll go with that? JP: Eh, I tried to get fancy and pick the Raiders last week. Never again (until I see next week's lines). JC: The Steelers have struggled on the road this year, the Jaguars have had a pulse at home, and, if you accept my premise that Houston isn't actually that good, Jacksonville might still be alive in the AFC South. This is probably The Alamo for the Jaguars. They need this game specifically to have any chance going forward, so this might be a kitchen sink type game for them if their coaching staff sees the writing on the wall. That has to mean something, right? JP: The Steelers seem due for a letdown, and Jacksonville's running game has feasted on Pittsburgh's defense the last couple times these teams have met. Not sure if Bortles puts it together enough to pick up the win, but this seems like it's gonna go down to the wire. JC: I've been ragging on the Rams the last few weeks for spreads that were too generous, but this one seems pretty fair. Both of these teams have explosive offenses, but the Rams have an appreciably better defense. It also helps that this a true home game for the Rams (it was originally scheduled for Mexico City but moved back to LA because of field conditions at Estadio Azteca). The half-point scares me, but I'll come back to the same rationale I've used a few times here this week - the Chiefs can actually afford to lose a game because they're effectively two games up on the conference (they have tiebreakers against Pittsburgh and the Chargers by virtue of head-to-head wins), while the Rams are tied with New Orleans and are on the wrong side of that same tiebreaker. The Rams just need this game right now more than Kansas City does, so based on that I'm willing to pay the extra half-point. JP: Defense is the difference here, more specifically, the interior of the defensive line, where LA has the talent in Donald and Suh to get all up in Mahomes' grill. Both teams will get their points, but the Rams seem far more likely to be able to find stops. Ultimately, I think this Washington team eventually falls apart down the stretch with all of their injuries, but I think Houston is getting too much respect here on the road. Does this Texans team really strike you as a "7-3 with seven straight wins" type of team? Because they certainly don't seem that way to me. They've won a few of those games by the skin of their teeth, and while Washington has a slew of injuries on offense, their defense has been playing exceptionally well, and a low-scoring game probably favors them. 1. The Texans offense plays the way it did two and three weeks ago, and just blows Washington out. 2. Houston guts out a win the way it did last week, and had four and five weeks before that, with a late touchdown or field goal. 3. Washington mucks things up and wins a close one. Two of those scenarios end a likely cover or push for the Texans. Plus, I just think they're the better team. Tampa Bay on the road this year has allowed 40, 48, 34, 37, and 42 points this year. The Giants certainly aren't good, but they've been showing signs of life the last few weeks, and they've been vaguely competitive at home. At the very least, they have talent at the skill positions, which so far this year has spelled disaster for Tampa Bay's defense. I mean, maybe the Giants are just good and functional to keep winning against fellow bad teams, but I actually trust Fitzmagic more than Eli at this point. On the real though, with Mike Evans, DeSean Jackson and O.J. Howard going against Odell and Barkley, this is actually a really exciting matchup of terrible teams. The skill talent is there. The Cowboys are this year's Jason Voorhees team. They're impossible to kill. I've written them off on at least three occassions this year, and then they follow that up with a win to keep them vaguely alive in the secretly terrible NFC East. Still, I think Atlanta is just better, and last week was the first time all year that Dallas looked like a real team on the road, and I'm not betting on that happening two weeks in a row. Atlanta seems to have woken up, and the Cowboys are incredibly unpredictable... So eff it, gimme the 'Boys on the road.